A damning report on rehabilitation and upgrading of Lae city roads released yesterday by Department of Works (DoW) shows that there was massive foul play in awarding of contracts amounting to almost K200 million. The report reveals that four contracts were procured for Stage 1 amounting to K24.4 million, 12 contracts were procured for Stage 2 amounting to K104.3 million plus variations, an additional K28 million was appropriated in 2012 to settle outstanding claims, and additional funding of K27.39 million is require to complete the remaining balance of works. 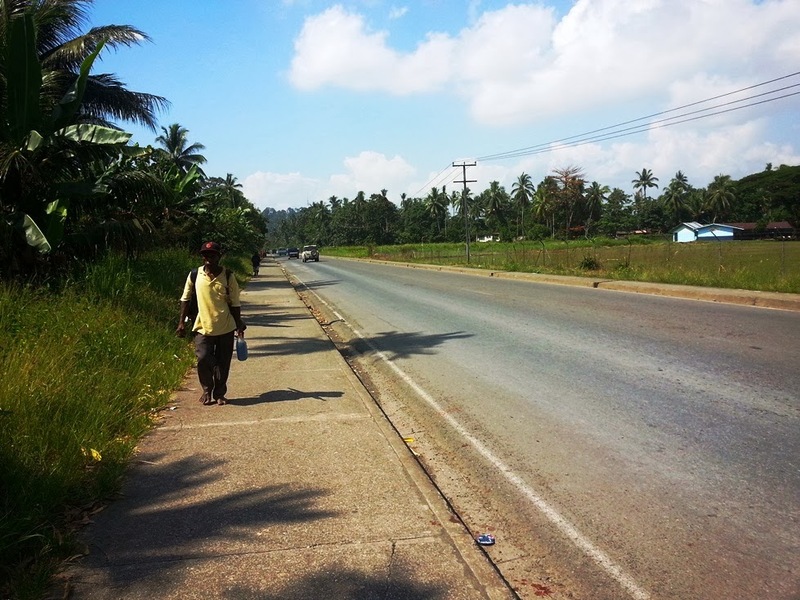 The government only transferred the administration and management of Lae roads rehabilitation and upgrading to DoW in August 2012 to ensure successful completion of ongoing works. Stage 1 works commenced in 2009 with contracts given to Dekenai Construction, East-West 1 Ltd, FTM Construction and Lae Engineering Ltd.
“In line with the national government’s aspiration to upgrade the Lae City roads to a standard urban city road status, K50 million was allocated in 2010 supplementary budget,” the report says. “By the virtue of the appropriation bill, the funding was allocated to DOW, however, the projects were hijacked at the central agencies and Central Supply and Tenders Board (CSTB). “NME International (PNG) Ltd was engaged as state’s representative to manage all aspects - design, procurement, project management - of these projects. “A detailed audit has been undertaken to establish the project financial and physical status. “The audit reveals that 12 contracts were procured which equates to K104.3 million, including variations. “The state erred from the beginning by awarding contracts above the K50 million funding appropriation. “Additional K28 million was appropriate in 2012 to settle outstanding claims certified by NME as well as completing the outstanding works under Stage 2. “Additional funding of K27.39 million is require to complete the remaining balance of works. “Most of this outstanding is paid from K100million appropriated for 2013. The report highlighted that most of these projects were procured under certificate of inexpediency (COI). “There was no justification for the expedited procurement for such important projects,” it said. “Ample time should be given for proper planning and technical design necessary to make informed investment decisions. “Consequently, a lot of ambiguities and variations have surfaced, thus DoW is doing its best to address and conclude these projects. “NME scoped for concrete pavement works, a highly technical task; there was no proper design to guide contractors. “Most contractors lacked experience in such projects and were not familiar in executing it. Inefficiency of unskilled contractors in concrete pavement and buildable design resulted in poor performance and slow progress. “Engineers’ estimates were unavailable to compare and review the contractor’s prices. “All contracts were awarded as per contractor’s pricing. “These prices were further inflated by variations due to poor scoping and design. “Department of Finance (DOF) paid over K30million in advance to contractors to commence work. “Some commenced as expected, however other did not commence until October 2012. 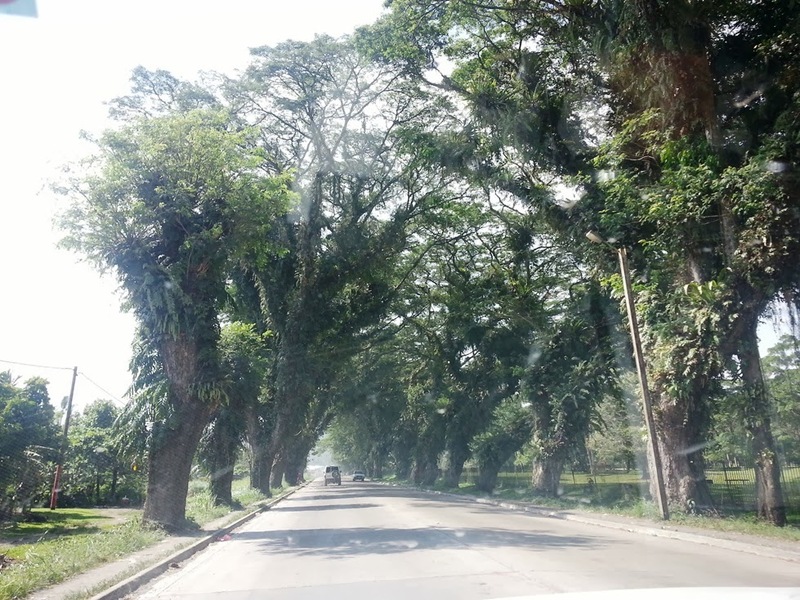 Not only did the Lae roads CONtractors f..k up our roads and steal our money, they even had the audacity and cheek, no bloody sense of respect or history whatsoever, to chop down many of the iconic rain trees of the 'Garden City'. Many of the silent sentinels of Lae are now gone forever because of some stupid, money-hungry con artists. A picture tells a thousand words...this is the excellent Busu Road between Ampo and Balob Teachers College together with perfect sidewalks which were built by AusAid in 1998-2002 but have stood the test of time. Compare that to the recent multi-million kina roadworks which have already started to fall apart. The Markham Valley of Morobe is known as the ‘Food Bowl of PNG’ and Binimamp village, in Kaiapit, is no exception. 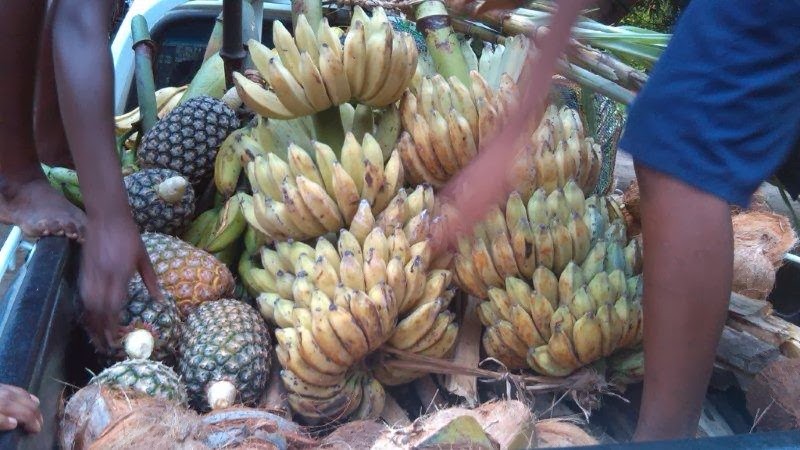 The people are prolific gardeners and grow everything they need to eat including bananas (marafri) and taro, as well as fruit such as pineapples and water melons. They also raise their own pigs and chickens. 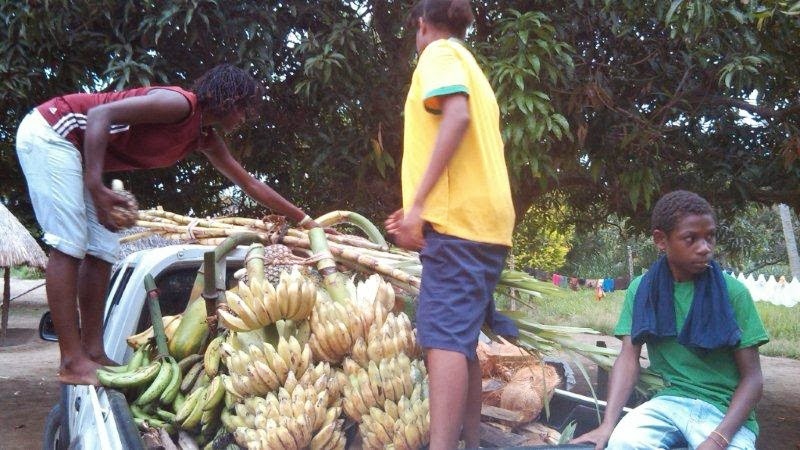 Former Lae MP and well-known banana farmer Bart Philemon was pleasantly surprised when he attended a family gathering between Yanga and Wagang villages on Saturday, Nov 16. His nephew, Ahi Nako (left), showed him a big bunch of bananas, offspring from Philemon’s farm at Malahang outside Lae. 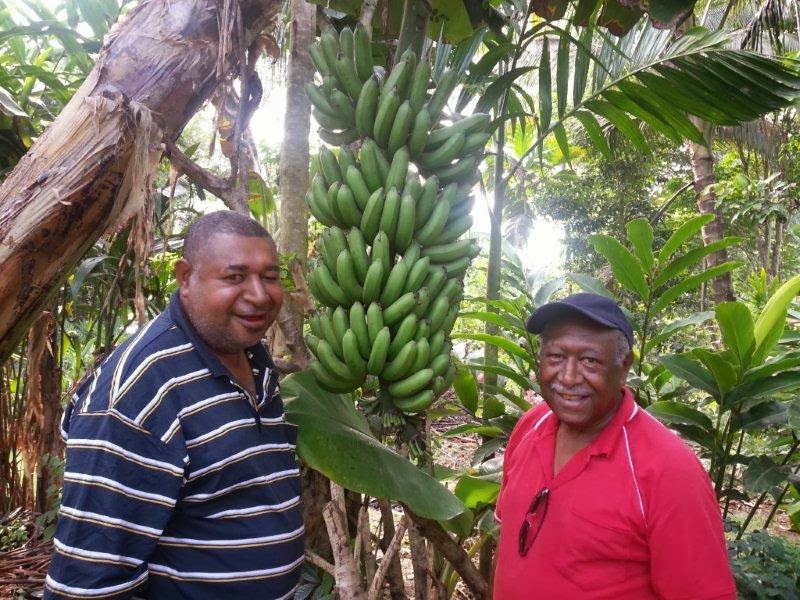 Philemon supplied bananas to supermarkets, resource projects and institutions around the country, and even exported to Australia and New Zealand, before entering politics in 1992 and was a four-time Lae MP until 2012. Commuters along the Leron Bridge stretch in the Markham Valley will not fail to notice the iconic ‘Peanut Boys of Leron’. The young men, who come from the nearby villages, sell big bunches of peanuts ranging from K1 to K5 to passers-by on vehicles. 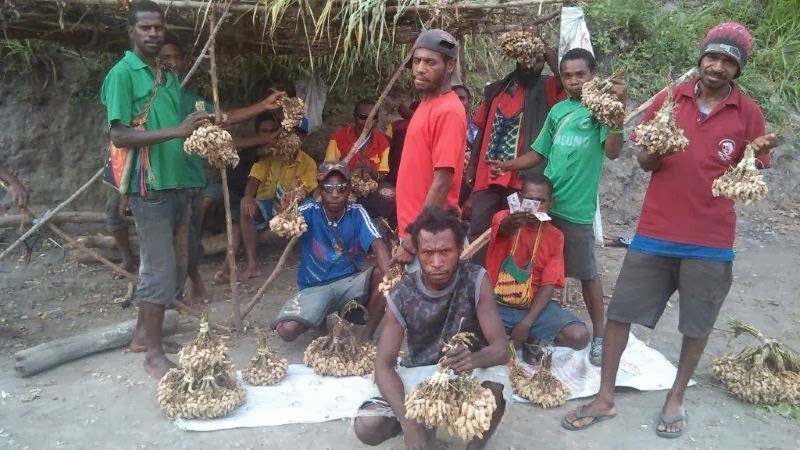 Given that hundreds of people travel along the Highlands Highway every day, between the Highlands and Lae, the peanut boys make a fortune. “We make a lot of money,” one said. The mother of an Australian man killed in a plane crash in Papua New Guinea lost another child earlier this year. Melbourne man Adam Reid, 38, died when the Cessna Grand Caravan operated by his employer Tropicair crashed in PNG's Gulf province on Monday. PNG nationals Stanley Kovi and Joyce Kori were also killed in the crash. Six other passengers and the pilot survived. Mr Reid's older brother Matthew was killed in a head-on collision with a semi-trailer in New South Wales earlier this year. Their cousin Noel Nealon says the family is devastated, especially their mother Cheryl. "What do you say to a mother who lost two of her three children that she cherished?" Mr Nealon said. "All she wanted to be was a mother and to lose them is such a tragedy." Mr Reid was an observer on the flight and had recently relocated from Melbourne to PNG to get more pilot hours. Mr Nealon says his cousin dreamt of becoming a pilot for the Royal Flying Doctor Service. "He wasn't even flying. He was just an air observer in the plane so whether he needed to be there or not, but unfortunately it happened," Mr Nealon said. The CEO of PNG's Accident Investigation Commission, David Inau, says the pilot made a forced landing after experiencing engine trouble. "The pilot did put out a mayday call and did state that he was having engine problems," he said. Investigators are today trying to move the submerged wreckage of the plane onto a barge to retrieve the bodies of those killed in the crash. Tropicair has suspended its operations while an investigation is carried out. Parliament this evening voted 92 - 0 to pass a law setting up the District Authority in each districts, replacing the Joint District Budget Planning and Prioritees Committees (JDBPPCs). The Bill was introduced by the Prime Minister. It is in line with his vision to strengthen government at district level, with more funds and resources now allocated to that level, where the bulk of our people live. Mr. Speaker, as a direct response to the cries ofour people in rural areas in the 2013 Budget Provincial Governments and Local Level Governments received significant amounts of development funding for the districts. Each district received K 5 million and each Local level Government received K500 000. Finally money was being paid directly to where it matters the most – districts and Local Level Governments. Mr. Speaker, we are seeing real development occurring. JDPBC around the country are rehabilitating roads, building foot bridges and purchasing much needed vehicles and equipment for police and other public servants. Just last week I was in Finschaffen for the opening of a multi-purpose office building to house the local bank, post office and district headquarters. The people of Finschaffen have access to essential services. This was built with the support of the local JDBPC using district development funds. Mr. Speaker, the JDPBC has been so successful that it has outgrown its original design. According to the Organic Law the JDPBC has a largely administrative role, it approves the Local level Government budget and makes recommendations to the Provincial Government on budget allocations and draws up the five year district development plan. Mr. Speaker, we all know that in reality the JDPBC is doing far more. It is now involved in the implementation of plans and programs at the district level. We need a proper legal framework for it to operate in. Mr. Speaker, this amendment Bill marks the next step forward. This Bill will replace the JDPBC with a statutory authority, a District Development Authority. The District Development Authority will be chaired by the open member and will have the same membership as the current JDPBC. Mr. Speaker, District Development Authorities will be able to enter contracts and sue and be sued. They will be the legal owners of all equipment purchased. There will be no more confusion about who owns equipment purchased with the DSIP. Mr. Speaker,this is a very simple amendment Bill, it will replace the JDPCB with a District Development Authority. The details of the District Development Authority will be provided in an ordinary Act which I will be brining next year. However, the benefits this Bill will bring are enormous and I look forward to having further discussions with members as we finalize the details for this significant initiative.